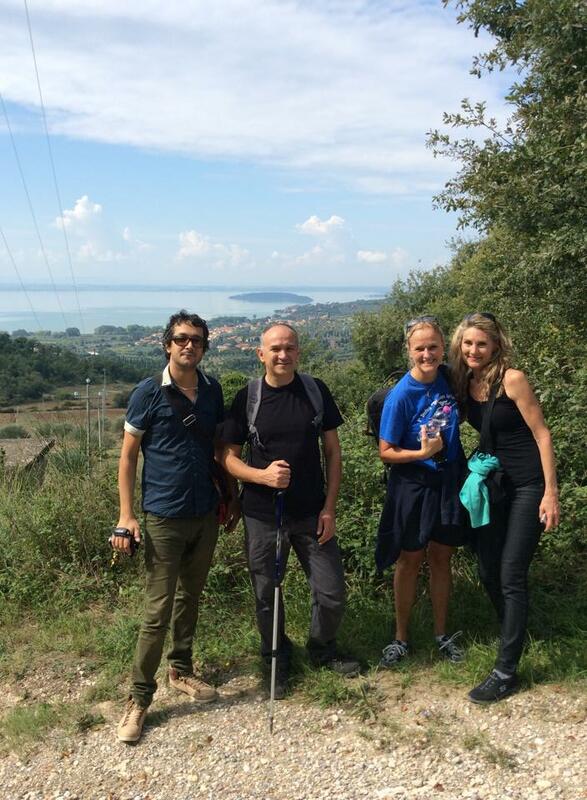 Federico, Fabrizio, Helena and myself get ready to start the hike to the Orsini Farm. Lake Trasimeno in the background. When was the last time you were greeted on a hike by a noisy band of geese? 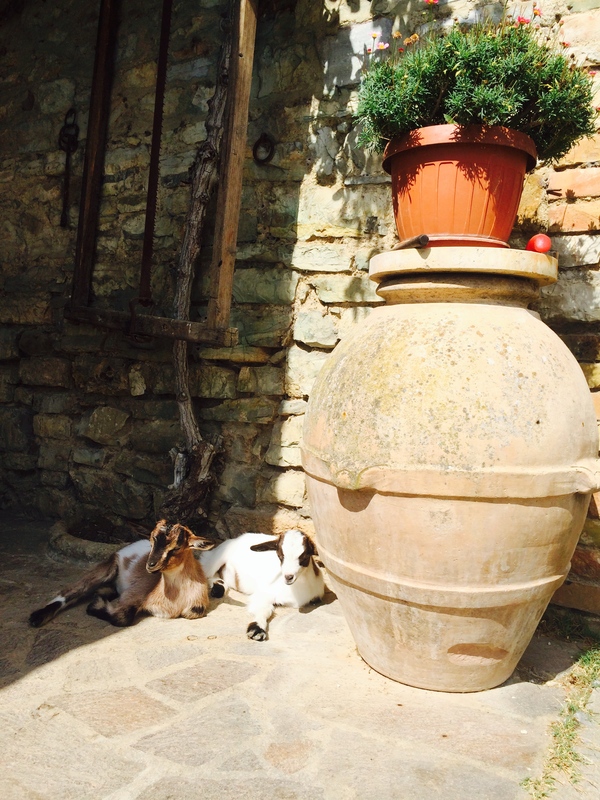 Like a royal round of trumpets, a herd of white geese announced our arrival at the Orsini Farm in Umbria. Piercing blue eyes sized us up and down as they waddled by. These guardians of the gate made sure the Orsini family and those in the vicinity were keenly aware of our presence. 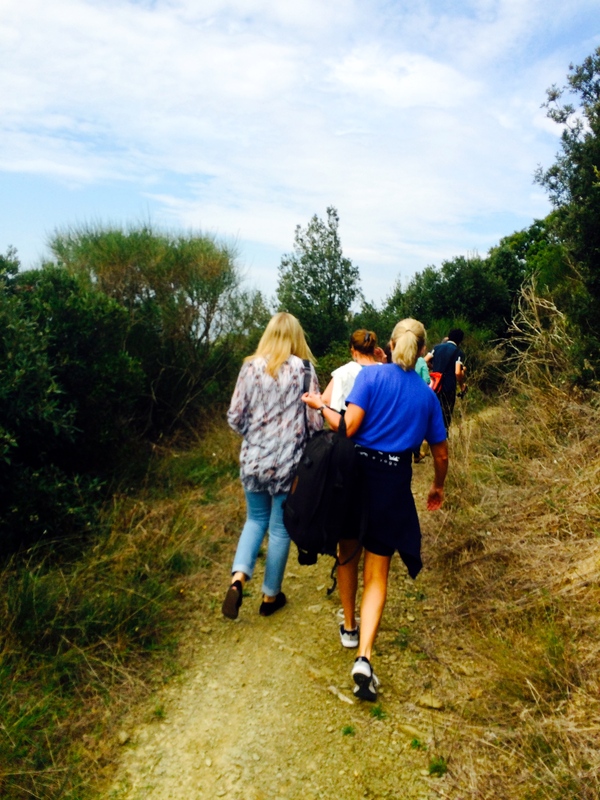 Earlier that morning, my blog tour group, This Is Your Time, met our guide Fabrizio at a trailhead near Lake Trasimeno in Umbria. 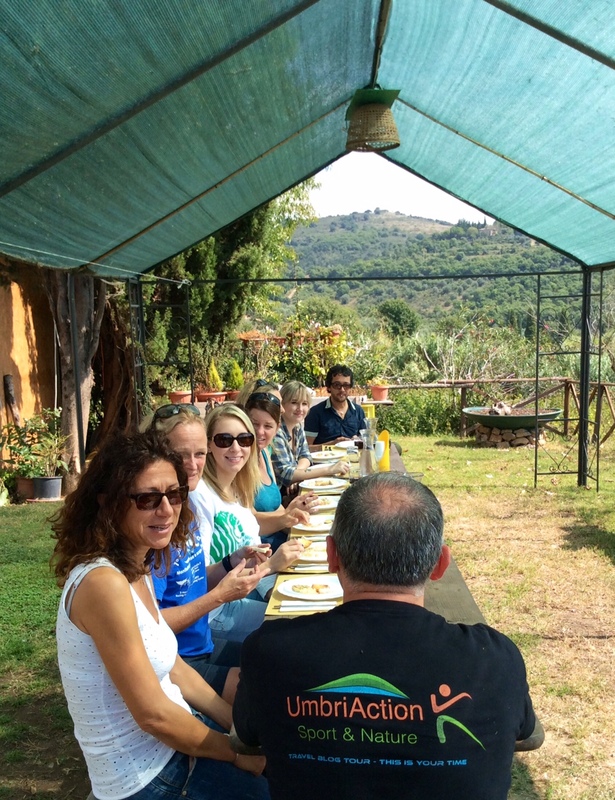 He works with Umbria Action, an outdoor adventure team designed to introduce the best back roads experiences of the region. Programs range from hiking, rafting, free flying, canyoning and biking just to name a few. Wine, food and cultural tours are designed for the individual or a group by guides who thoroughly know the land and are enthusiastic about sharing it. We met our tour guide Fabrizio, soft-spoken and very knowledgable about the area. 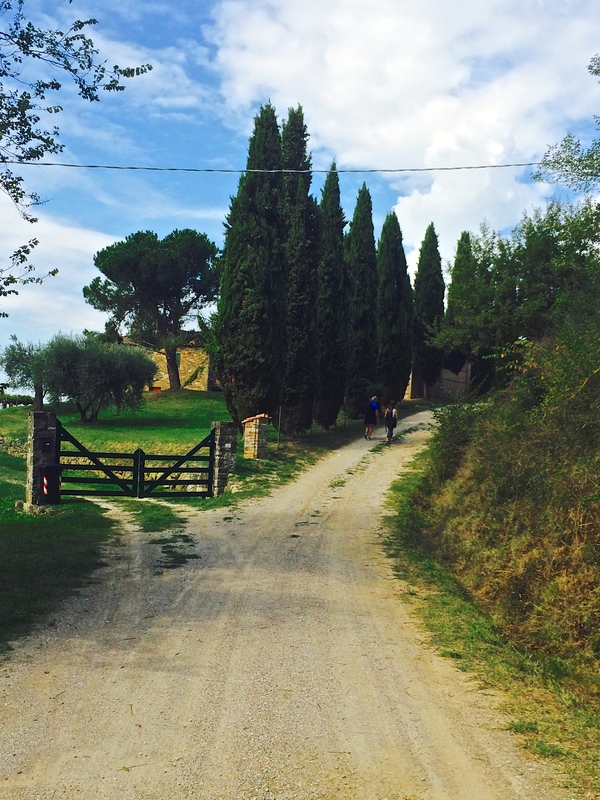 He took us on a trek through open fields and groves of tall green trees with lovely views of Lake Trasimeno. Along the way, he pointed out the various types of plants native to the area. 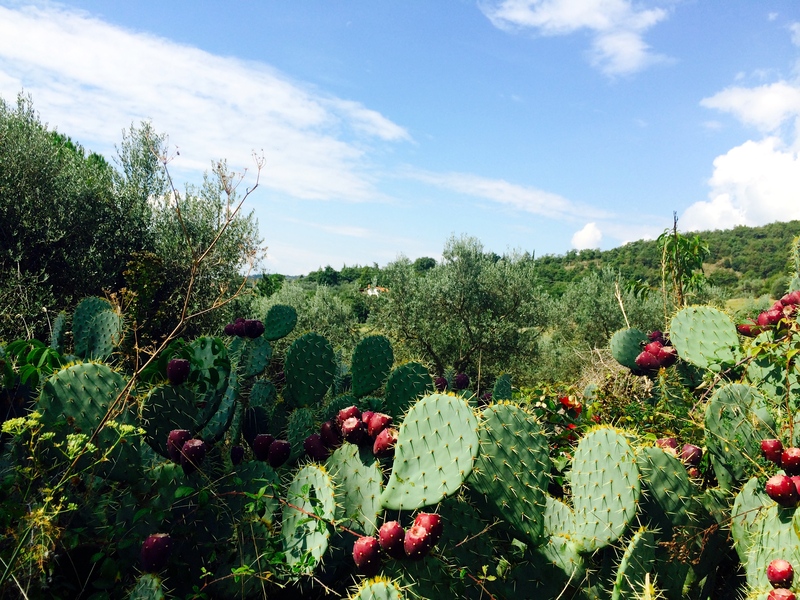 Prickly pear cactus grew in mounds with bright red buds. Fabrizio proved to be an excellent guide who answered our questions with a lot of patience. We passed charming old villas lined with Cypress trees. The air was fresh and clean with only a hint of a breeze. I felt like I had just stepped into one of my favorite Italy scenes. All was peaceful and quiet except for the crunch of our shoes on gravel and quips of conversations shared between us. We arrived at the Azienda Agraria Orsini farm, our destination for lunch and a farm tour. Unfortunately, I didn’t get a photo of our welcoming team of noisy white geese with piercing blue eyes, but trust me, they were there! As we approached the house, two baby goats skipped playfully out from under the shaded patio followed by a couple of quacking ducks. Perky and nimble, we laughed as the baby goats pirouetted around our group. Soon puppies began to wiggle from underneath the old rock and mortar farm-house. We were highly entertained by these little members of the Orsini family. 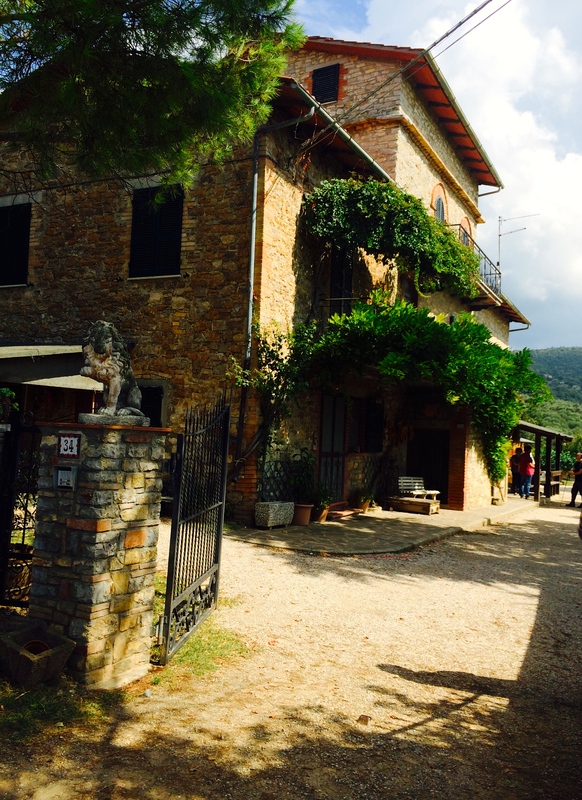 The Orsini Agriturismo is a small-scale, family run operation, all sowing and harvesting is done by hand including fagiolina beans, grapes for wine, and olives for olive oil. The fagiolina beans are native to the area and had nearly died out of existence. Thanks to Flavio Orsini, the family has worked hard to cultivate them and once again bring them back to the meal table near and abroad. 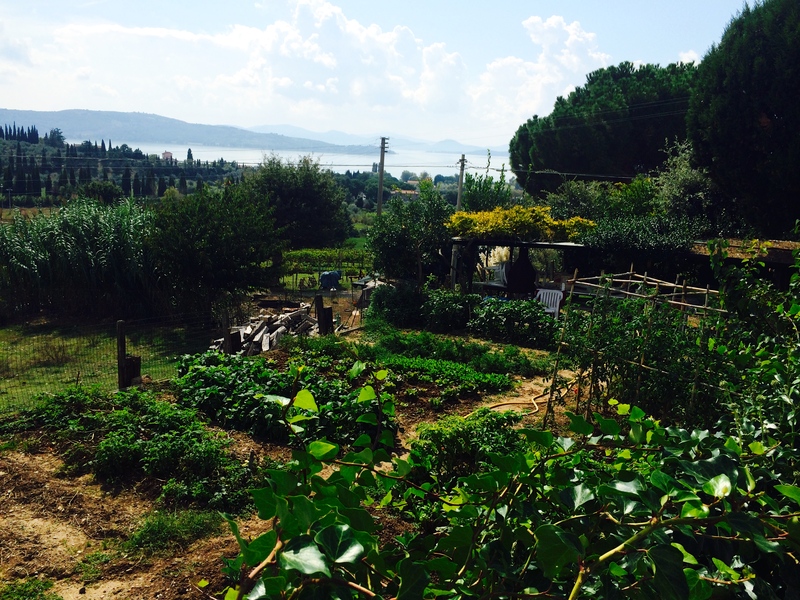 A visit to the Orsini Farm means “spending a few hours immersed in a simple atmosphere of nature and colors that represent the great beauty of the hills of Lake Trasimeno.” We were introduced to the traditional local cuisine as well as the old authentic techniques of production. 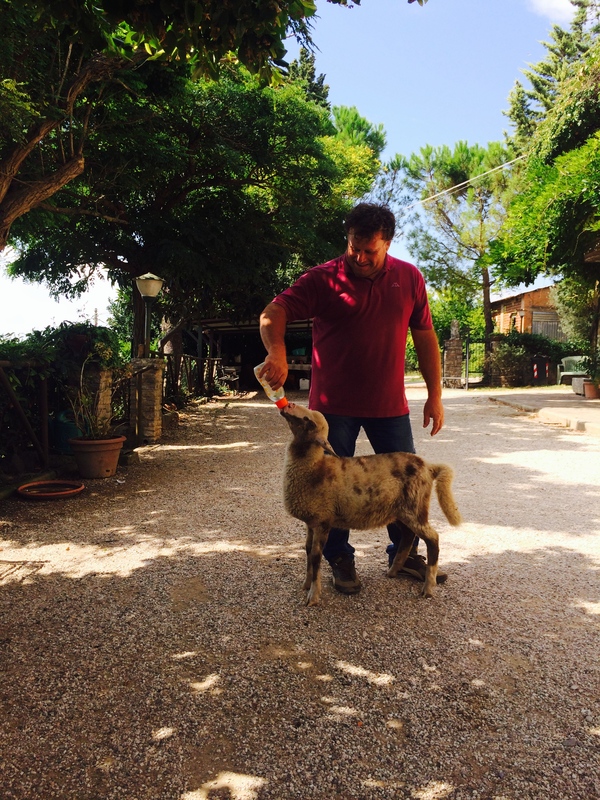 Flavio Orsini is the family patriarch and president of Umbria’s Slow Food Movement. The Slow Food Movement is basically everything fast food is not. For example, Slow Food is all about preserving indigenous varieties of plant and animal food sources. It is also the promotion of local culinary traditions and local foods as well as preserving the local food products along with the lore and preparation. Organizing small-scale processing is very important in bringing about a complete cultural experience. Flavio took us on a farm tour and gave us a demonstration of how he shells the fagiolina beans that he harvests on his property. Afterwards, the bean shells were carried to the goat pen and dropped over the fence. Nothing goes to waste. This is one of the major themes of the Slow Food idea. Lunch was a long wooden table with plates of various traditional crostini. Carafes of full-bodied red wine provided a wonderful tasting experience. Fabrizio and Paola, both from Umbria Action, joined us at the table. 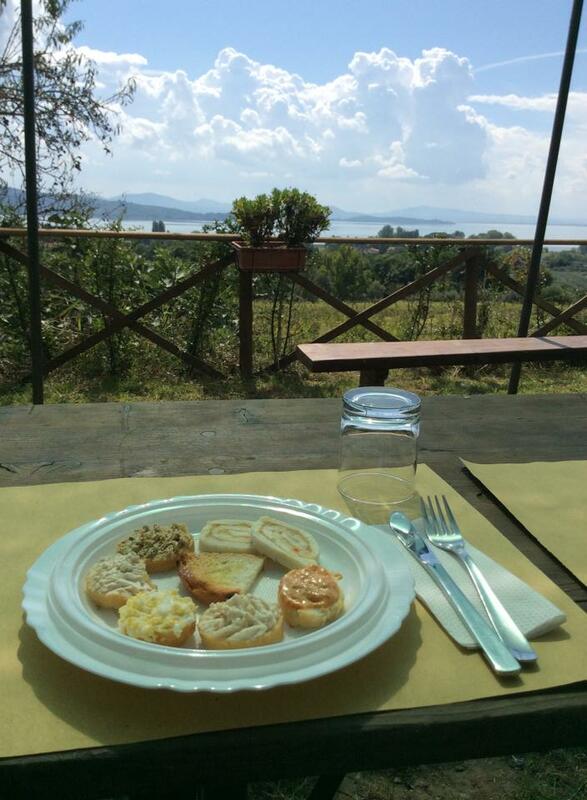 Our view was the beautiful and serene Lake Trasimeno. 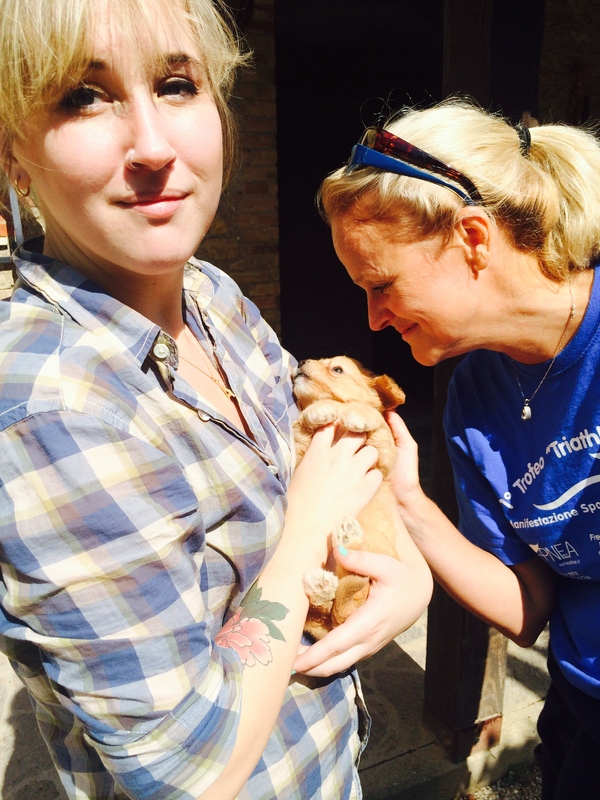 Paola could no longer resist and picked up one of the scampering puppies. They enjoyed a nose to nose moment of puppy love. After lunch and the farm tour, we said good-bye to Flavio and his family. We had places to go and things to see before nightfall. But we found ourselves lingering too long. The Orsini Farm was a beautiful oasis in a world spinning out of control. Nature worked side by side with man in perfect rhythm. It was all good and right. And very hard to leave behind. Absolutely gorgeous, I feel that sun on my back…what an wonderful walk, beautiful photos as always Susan. And as for that puppy, well,,,so cute!!! Thank you Sherri…it was magical!! You must tell me what Noah’s connection is to Lake Trasimeno! OK, I’ll dig out the reference again and send in due course. 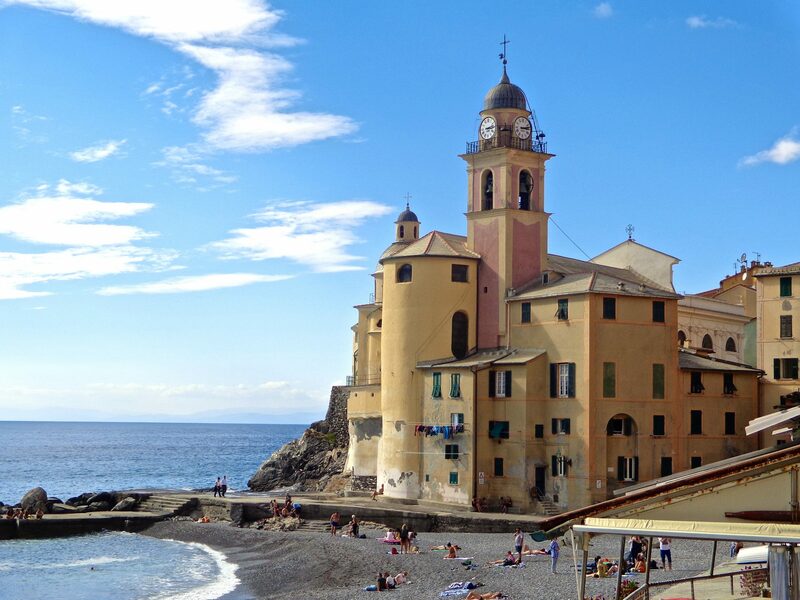 Idyllic Italy! Lovely…you got me at the pups & goats! Me too Lyn. I would love to do a lot more.